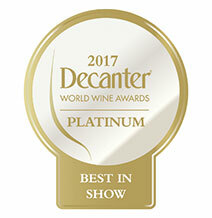 Crush Wines are delighted to announce that Martin Wasmer, Schlatter Spatburgunder 2014 has won Platinum in Best in Show at Decanter World Wine Awards 2017. The competition was judged by Sarah Jane Evans MW, Gérard Basset MW MS OBE, Michael Hill Smith MW, Andrew Jefford and Andy Howard MW. From years of experience (he began making his own Pinot Noir in 1977), he tells us: ’It’s easy to have lots of fruit in Pinot, but then you lose out on power and. Likewise, it’s easy to achieve power and sacrifice fruit. Combining two is the art: achieving full fruit with expression, length and finesse.’ Decanter Magazine (November 2017). Martin Wassmer is a family producer who specialise in all the Pinots – Spätburgunder, Weissburgunder and Grauburgunder. They harvest low yields, nurture old vines using only natural yeasts and guard traditional winemaking techniques. Previously, Martin Wassmer was awarded The Best Red Wine Collection in Germany in the new edition of the Eichelmann wine guide.